We resumed work at Mount Mica pretty much on schedule March 20th. Richard had gotten a head start the prior week on hauling out the ice and pumping the water. Or plan was to take up again trying to get around and behind pocket 11-05. Pocket 11-05 was not completely dug out. Portions of the pocket were nearly impossible to work. The bottom tapered and dropped quickly along the southern edge and in this taper some of the best gem was found. The grand plan then was to get along side of the pocket, a little below it and work some of this narrow space from the back (down dip) side. To accomplish this we would be mining in a southerly direction. The next week was spent on another 3m advance. Once we had cleaned out the muck and washed the face down, we could see schist on the left had side of the advance. I had been concerned for sometime that the emergence of the collection of xenoliths was not a good sign. On the other hand, pocket 11-05 had developed within centimeters of the western edge of once of these huge xenoliths. 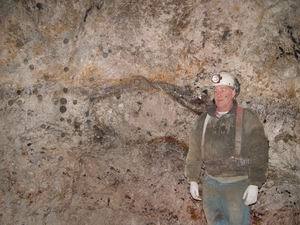 The near 3 months of effort to get to where we werein this effort had been in essentially barren pegmatite. So to avoid yet even more input without output, we decided to drill an number of 3m exploratory holes. At best this is a 'hit or miss' business. 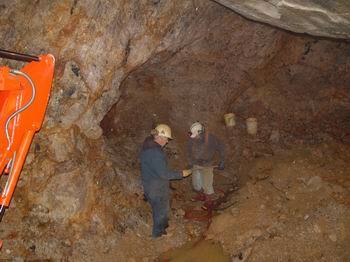 For example, we had very good luck mining down dip of the 1979 Dagenais pocket. Rene Dagenais, on one of his many recent visits to Mount Mica, explained how they had similarly probed beyond his pocket in 1980 and concluded there was not much there. His huge pocket was essentially barren of tourmaline yet we found nice tourmaline within feet of the down dip side of the pocket. So when our exploratory holes hit schist within meters of where we were working in almost every direction , it was time to entertain a radical re-working of our mining plan and . We'll return to this area just to make sure we have not made a similar miscalculation to Rene's. 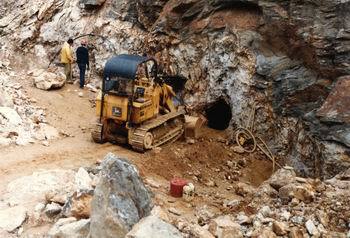 So far our work at Mount Mica we have intercepted 4 steps in the pegmatite. Our mining started on the far western end of the pegmatite on step 'A' as indicated in Figure 1. 'A' proved thin at only 1.5-2.0m. Step 'A' produced pockets but no tourmaline. As we moved closer to the main pit, we intercepted step 'B'. This step was thicker and produced pockets 1-04 through 11-04. With the exception of 1-04, all contained elbaite. Mining further to the east we entered into step 'C'. The 1979 pocket of Rene Dagenais, pocket 28-04 and pocket 11-05 was in each case just east of interface between steps 'B' and 'C'. 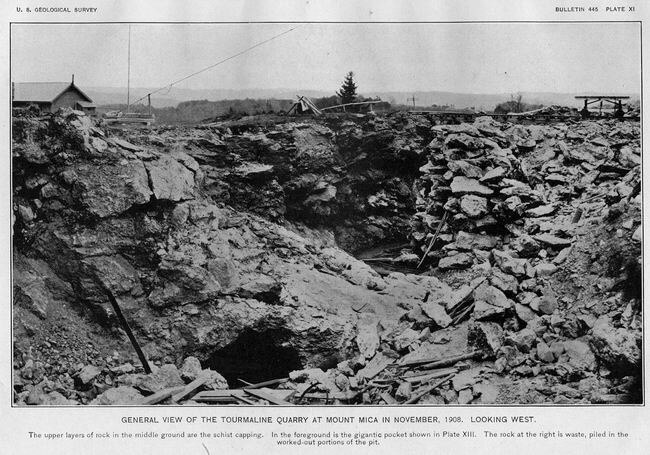 (In the image to the right the portal of the 1979 pocket can be seen just to the left (east) of the BC steps in the pegmatite. It is clear now we spent the majority of '05 mining along the interface between steps C and D. (Dashed area in Figure 2) There the pegmatite appeared to be quite thick, but was in fact the area where step 'C' ascended to 'D'. Figure 2: East- West cross section of the pegmatite detailing the 4 steps. Our first pocket of 2006, MMP1-06. This 1st pocket was relatively clean and yielded a small amount of fine blue elbaite. 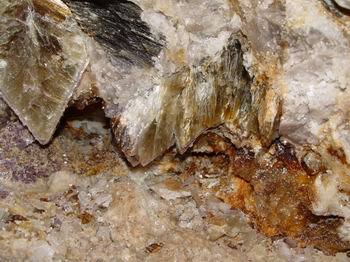 These crystals were arrayed around a central schorl that penetrated the pocket from ceiling to floor. 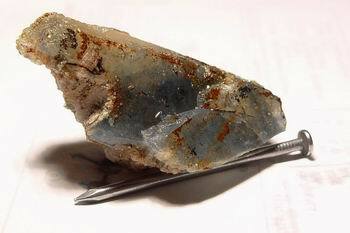 The schorl was more than 12 cm in diameter and the part that was within the pocket had developed a bluish green rind. Lepidolite rimmed mica books, with points down, projected from the ceiling. Lepidolite rimmed mica books project from the ceiling. The pocket, though small, took us nearly a day and a half to fully clean out. Most of the best gem was locked in cookeite and required care to extract. As we expanded the advance and fanned the side walls to widen the cut, we found 3 other small clean pockets. 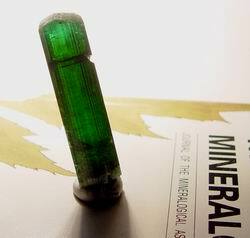 Each had some tourmaline. 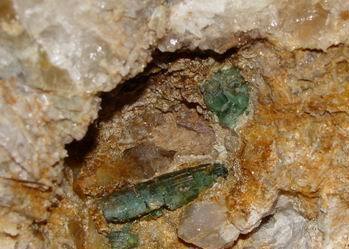 Pocket 4, on the left wall of our advance contained several tourmalines locked in the pocket wall. 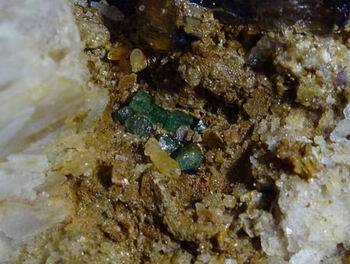 Each started as small schorls but as the emerged into the cavity they converted to blue and green elbaite. An unusual feature of this pocket was the quartz. A few of the quartz crystals were so included with blue tourmaline they were blue. The mineralization we encountered ascended on the left wall of the advance climbing nearly to the roof of the cut near the center of the back wall and then descend rapidly into the right side wall forming an arch like pattern. This feature allowed us to make the next burn, the 4th , on the right side of the advance and above the mineralization where it would do no damage. After the burn was completed we expanded the advance on the right side above the mineralization. As we began to widen the advance left of the centerline, we drilled into a space. After shooting the holes above the drill hole that had intercepted the space, we were able to use our CP9 chipping hammer to open pocket another pocket (MMP5-06). 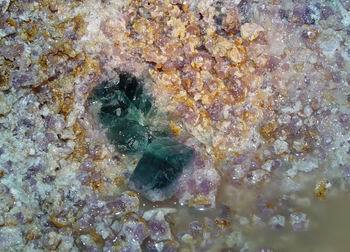 5 contained elbaite of a rich blue color. The best pieces were locked within the hard lepidolite lining the bottom of the pocket. There was only limited amount of loose cookeite in pocket 5 though. 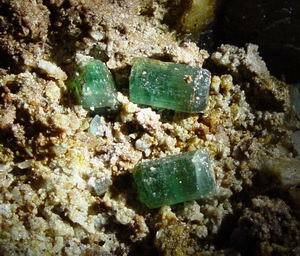 In it Mary found the best elbaite. It was broken into 3 clean sections each a slightly different shade of blue . Each piece was 15 carats or more of gem. As Richard and I continued expanding our advance to the left we found another small series of interconnected vugs. For all of these pockets small was the dominant theme. After pocket 11-05 they appeared tiny yet each had a small offering. A blast revealed a small vug that regurgitated this fine crystal. The 2 upper sections were substantially gemmy. This elbaite had the good fortune of not being encased in lepidolite. We continued working to the left and soon intercepted another pocket. Once we have drilled into a pocket we often used our blow pipe to see what might be ejected from the pocket through the drill hole. 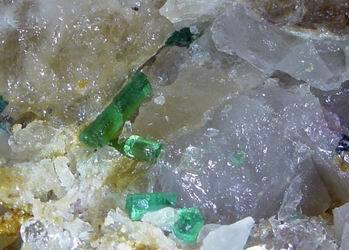 This time a small gem piece of green tourmaline came out with the mica flakes and quartz chips... a most promising sign. By careful blasting we were able to remove the pegmatite such that we could again open the pocket using our chipping hammer. This pocket proved to be much like all of the others. Lepidolite rimmed micas formed the roof. A few fractured but gemmy smoky quartz crystals lined the walls. The floor was coated with lepidolite but this time rather than being a bright lavender it was a pale gray. 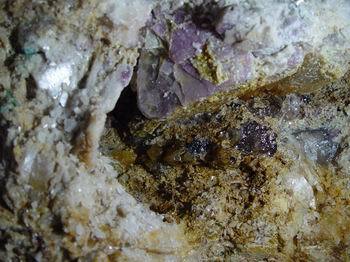 Like pocket 5, within this lepidolite some fine elbaite crystals had become entrapped. ( see image at the top of the page). Only by careful chisel work could they be liberated. The best crystal from this pocket was very reminiscent of some of the classical Mount Mica material. 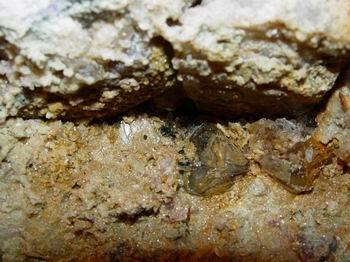 The abundance of mica in the mineralized zone of step 'D' is unlike anything we have so far encountered. Each blast pours out huge transparent mica books up to .6 m long and .4 m thick. Another observation piquing our curiosity...why where the pockets we were finding now so tightly packed together? We were use to more distributed and perhaps larger pockets. It struck me as I was examining the Loren Merrill picture in which the pockets had been flagged as to how tightly bunched the flags were. This was now our experience. 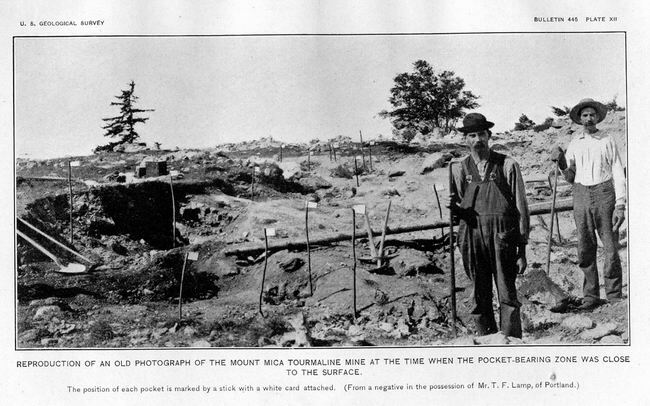 In Hamlin's History of Mount Mica it was noted how abundantly mica littered the ground around the site of the initial tourmaline discovery. Had Loren Merrill and Hamlin and others before them been working the trend we have labeled step 'D'? My projection of step 'D' led up dip to the base of the Merrill dumps. Figure 5: By the early 1900s Merrill had expanded their workings considerably. Using a stiff legged derrick, the muck was stacked behind as the pit was advanced down dip.